Nurjahan Begum was one of the earliest associates of microfinance pioneer Professor Muhammad Yunus when he founded Grameen Bank in 1976 in the village of Jobra in the Chittagong district of Bangladesh. A student of Chittagong University, Nurjahan played an important role in organizing poor rural women in Grameen Bank’s grassroots groups during the bank’s earliest, most challenging days. At that time, rural women were hardly allowed to go outside and speak to non-relative males, let alone take out bank loans from a financial institution. Poverty, illiteracy and superstition were prevalent, and oppression against women was widespread. Nurjahan had to fight these realities while working in the poorest areas of Bangladesh—Chittagong, Tangail, Rangpur and Patuakhali—as a program officer, motivating and training local young women who joined Grameen Bank. 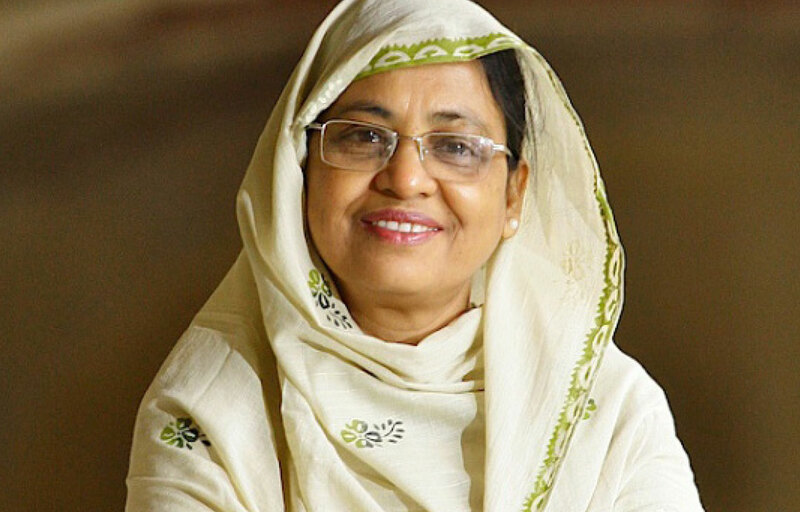 She inspired educated girls of Bangladesh to take on careers dedicated to helping disadvantaged women. She headed a special bank program to provide leadership training to Grameen borrowers and implemented many of the institution’s social development programs. She was instrumental in creating Grameen Bank’s well-known “Sixteen Decisions,” which guide the organization’s social development goals alongside microcredit operations and continue to govern the bank’s mission of today. Nurjahan served Grameen Bank for 35 years before retiring in 2012. She was general manager of training and international programs for more than a decade as well as principal of Grameen Bank’s Central Training Institute. She served as deputy managing director before assuming the role of acting managing director when Professor Yunus retired in May 2011. Through the years, she has worked as consultant, trainer and evaluator of microcredit programs. She has also lectured at universities, conferences, and seminars around the world, gaining knowledge of development and women’s issues across diverse cultures. One of Nurjahan’s biggest passions is education. She is managing director of Grameen Shikkha (Grameen Education), an organization founded Grameen Bank in 1997. Grameen Shikkha is a non-profit organization providing scholarships, vocational training, non-formal primary education and early childhood development across Bangladesh. The organization has taught basic literacy skills to more than 3,000 illiterate women borrowers of Grameen Bank and has given scholarship support to more than 4,000 poor rural students, about 900 of whom are now pursuing higher studies. It also offers pre-school education to more than 150,000 rural and urban slum children; early-childhood care training to about 135,000 rural women; and early-childhood orientation training to about 3,000 officials and local elites. Nurajahan’s work with Grameen Shikkha continues to focus strongly on training and is integrated closely with Grameen Bank’s other programs. The organization provides vocational training programs through Grameen Shamogree (Grameen Products) in tailoring and dressmaking to poor adolescent girls and women in Chilmari, one of the poorest and vulnerable areas in the north of Bangladesh, so that they can work in Grameen Shamogree’s local production centers. Though she officially retired from her position at Grameen Bank, Nurajahan’s commitment hasn’t slowed. She is chairperson of Grameen Distribution Ltd. and serves on the boards of several organizations, including Grameen Trust, Grameen Agricultural and Livestock Foundation, Grameen Shakti, Grameen Knitwear, Grameen Kalyan, Grameen Healthcare Services Ltd., Grameen Telecom. She is also on the managing board of the Center for Mass Education in Science (CMES), a leading Bangladeshi NGO working in human resource development through education and skills training. She also worked as director of Grameenphone Ltd. Bangladesh and Grameen Foundation, USA. Nurajahan’s work has been recognized internationally. She participated in the Fortune Most Powerful Women Summit held in Los Angeles in 2007 and was appointed president to the Foundation for Justice Prize giving ceremony held in Valencia, Spain in 2007. She received the Susan M. Davis Lifetime Achievement Award for 2008 by Grameen Foundation and was awarded the World Summit Millennium Development Goals Award 2009 and the Vision Award 2009. Chandralekha Chaudhuri from Kolkata, presently stationed in Pune, interned with Ujjivan in 2007 and later joined as part of the institution’s first group of management trainees in April 2008. She is currently managing the credit team for the Western region in Ujjivan.